Elvira Nabiullina has officially taken over the chairmanship in Russian Central Bank from the former head of the monetary regulator Sergey Ignatiev on Monday. Ignatiev will remain working at the institution as Nabiullina’s adviser. 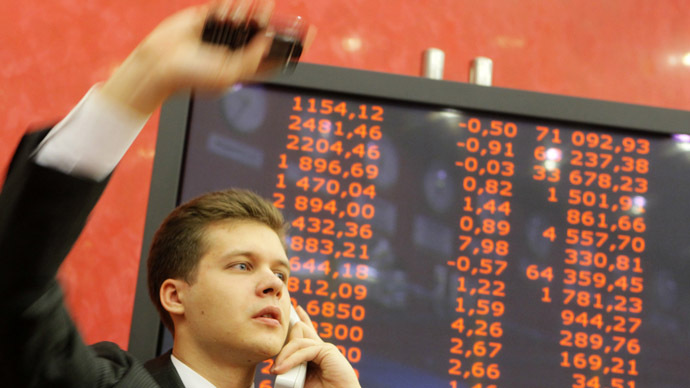 The Russian economy is expanding at the slowest pace since the 2009 contraction. “I would say the policy should be continuity, but taking into account new challenges,” Nabiullina said Monday. “Slowing economic growth is a reality that the central bank will need to consider,” she added. Nabiullina has said that it will be difficult for Russia's $2 trillion economy to reach the 5 percent annual growth rate the Kremlin has set out to achieve. "With the current structure of our institutions, 5 percent is just impossible," said Nabiullina, Reuters reported. She added that such an aggressive growth policy using Central Bank liquidity could lead to stagflation in Russia. Elvira Nabiullina, 49, is a former economy minister and will have to deal with the conflict between the government and the central bank over lowering interest rates, which in the government’s view is a quick way to boost growth. Speaking to the Interfax news agency Nabiullina said devaluing the rouble and lowering interest rates are “dangerous” options for the economy. 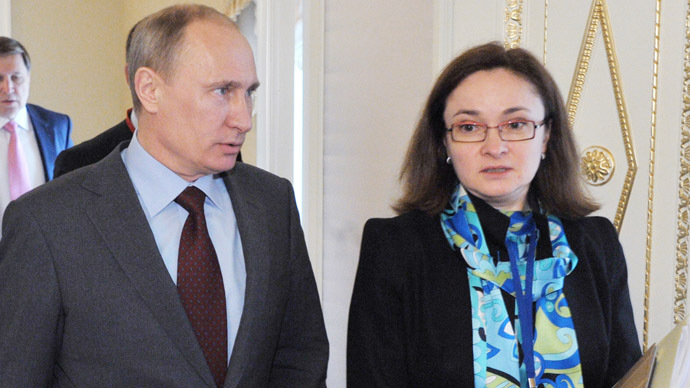 The Russian State Duma approved Nabiullina’s nomination for the top post in the Central Bank in April, after President Vladimir Putin picked his chief economic aide and member of his inner circle to lead the monetary authority. Before Putin nominated Nabiullina, there had been several other possible candidates for the chairman’s job, including Central Bank First Deputy Chairman Aleksey Simanovsky, the head of VTB Andrey Kostin and another Central Banker Mikhail Sukhov. Among them also was Aleksey Ulyukayev, Russia's Central Bank deputy head, who was today appointed as the new Economic Development Minister. 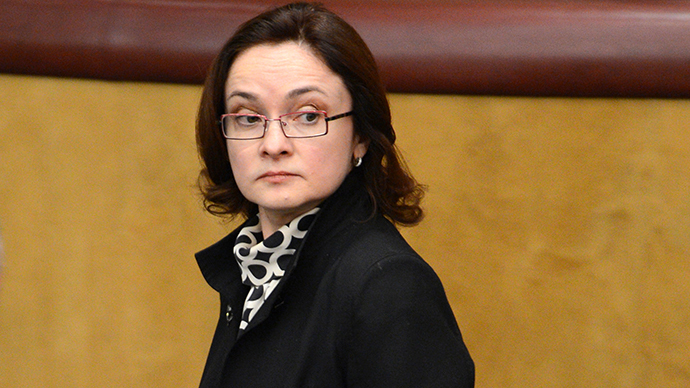 Elvira Nabiullina was Russia's Minister of Economic Development and Trade in 2007-2012. In 2012 was made the President’s chief economic aide. Meanwhile Economy Minister Andrey Belousov was appointed to replace Nabiullina at the presidential administration according to a Kremlin statement. “For me it is very important to focus on institutional solutions, changing the institutions which would lead to long-term changes. Such work not always provides quick results. But it is improving the quality of the institutions. High quality regulation can seriously change the situation in the economy like nothing else,” Nabiullina told Kommersant daily. The main questions are the value of the Russian currency and interest rates. They have been in the spotlight during the recent SPIEF, St.Petersbug International Economic Forum. The rouble has significantly weakened over the past week, after Finance Minister Anton Siluanov said the institution plans to begin a slight devaluation of the Russian currency to boost demand. “A small weakening in the rouble’s exchange rate can play a positive role in the federal budget revenue and the economy as a whole,” Siluanov is quoted by Bloomberg as saying. The Central Bank has been supporting freely fluctuating exchange rates. Nabiullina agrees, saying weakening the rouble artificially in order to boost exports can be “dangerous” in the current unstable global economic situation. Another problem Russia has yet to solve is the urge to boost available credit to small and medium-sized businesses. Elvira Nabiullina is facing a tricky task to deal with the conflict between the government and the central bank over interest rates. According to First Deputy PM Igor Shuvalov the government has already developed proposals, which will help to bring down the value of corporate loans. Nabiullina has rejected the proposal put forward by former Economy Minister Andrey Belousov and now the presidential aide on setting indicative lending rates that may be used to determine whether the banks are charging too much, Bloomberg says. “The banks will not lower their rate to the indicative, they will simply stop lending,” Nabiullina is quoted by Kommersant as saying. “When we begin restraining prices of any product, bread, gas or loans, it causes a deficit of this product,” she added. Nabiullina also said she sees improving the investment climate in Russia among the top priorities.